And its still the only version of teh Justice League that I really love. By the way: Your previous comment (sent along at the same time as this one) was accidentally deleted...and I'm not sure how. Sorry! Feel free to reconstruct it and send again! In my opinion, the best Justice League incarnation of all time was the animated series from the early 2000s by Bruce Timm and Dwayne McDuffie [RIP]. Of course, JM had a hand in that too! Loved working on that series, George. Very gratifying to be part of something that's come to be known as a classic! I still remember the day I bought issue 1. I read that series over and over again so many times. My issues are not in the best of shape. Still one of my favorite comic series of all time. Thanks, Douglas! 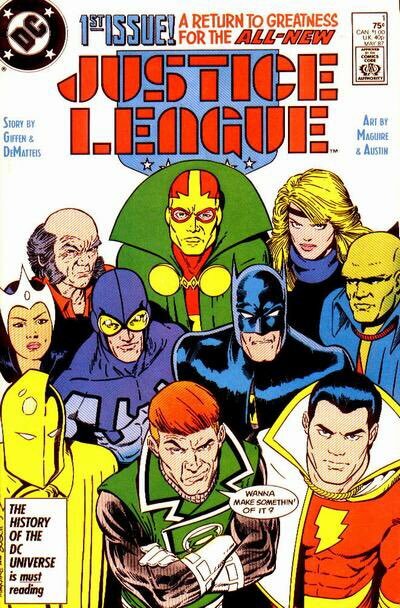 I'm so grateful for the long, healthy life our various JLI books have had, Never expected it, which makes it all the sweeter! No "Red Velma" or "Red Velm-ja" joke in this months issue? I feel like the JM Dematteis from 1987 wouldn't have passed up the opportunity. Not even a a "did you raid Red Sonja's closet from her awkward phase?" props on the Magilla Gorilla and Peter Potomus references though. Red Sonja jokes didn't even occur to me. Glad you caught the other HB references! I take it that this wasn't written in anything resembling the Marvel method, where you get to see the artwork as you put in the dialogue. That really looked like Red Sonja's attire in her modest days. And I'm a little ashamed to have gotten those Hanna Barbara references. It was another good issue though. It IS Marvel Method and it isn't. Keith's plots are little mini-comics and I dialogue from his layouts. My script then goes off to the artist who, all that dialogue in front of him along with Keith's plot, draws the finished art. Not the best image to prove my point, but the best I could find. Just to be clear: I write from Keith's plot, but see all the finished art as it comes in, so of course I know what the finished book looks like. I just wasn't thinking about Red Sonja. Oh fair enough. But I bet now you can't stop thinking Red Sonja. Or about a chicken salad sandwich. I don't know your life, Dematteis. What, I like perogies? And it might not be too far off from how some would respond to ol' R.S.. I said some, not me. I do have SOME class. Maybe Velma found that artifact that had M.J. Watson possessed by Red Sonja. That comic got really weird at times. Chris Claremont... he never wrote a red head he didn't want possessed by something. Better make sure that he never takes over the official Happy Days comic, Ron Howard has a lot of pull in tinsel town. It is a fun comic, though. Now I want Perogies. Good thing I live in Michigan. Can you get good perogies in New York State, Dematteis? Obviously, potato is the best (and he varying with in). No doubt. But if you haven't tried sauerkraut perogies... I recommend you get to gettin'. Have you ever been to NYC, Jack? You get the best of EVERYTHING! And, yes, potato's the best. Sauerkraut? Not my thing. And we've come a long way from discussing the JLI's 30th! First, I call bull crap on that. As I pointed out here once before, I lived in that city. They don't even have the best hot dogs... much to there denial. A good ol' Motown coney wins every time. They sure as Hell, can't compete with any place in the rust belt, and its huge polish populations, in pierogies. And if you want the best possible perogies, a Polish-Jewish woman (And yes for some reason both woman and Jewish matter)'s perogies, after a lifetime living in the Chicago, Cleveland, or Detroit-Metro life, honed by years if not decades of passbacks. I don't know what the difference in Jewish perogies is...or even if there is an official one... but it is there and amazing. Best of everything ?! First they decent wages for working class employees, then punk (yeah you Ramones, I think some one owes a thank you to the Stooges and MC5), then Jim Starlin. I already mentioned there the hot dog lies (want proof, Michigan has the strictest Meat processing laws in the country) I'm not letting them claim perogies too. Line drawn. Its a stupid line, but I drew it. Discussing Demateis-written comics? What would give yo the idea this would be the forum for that. I can't help but noticing a certain amount of political fervor in that twitter box-thing. Maybe its time for that Ben Urich starring story by J.M. Dematteis, I occasionally bring up... all of twice, I think. I just want a Ben Urich starring story, I love the character. Just don't do what they did in the Daredevil TV show with Karen Page, where she played jumprope with journalistic ethics, and was then rewarded for it. They exist for a ######### reason. Anyway, have a nice day, I'm going to bed. Good night, Jack. Or good day. Or whatever works for you. And you thought politics, religion, and the economy was a hot-button topic. Pan fry them up with some onions, peppers, and pre-cooked chicken (if you have it), and you have a pretty decent meal. Now, I believe you have a Ben Urich pitch to prepare. I will leave you to it. I'll put that in my upcoming best-seller CREATION POINT COOKBOOK. A cookbook with instructions for freezer bought food sounds like something from the 80s to pray on still single Baby Boomers and D.I.N.K.s (dual income no kids) living in cites, and unable to find time or space to cook, or acquire fresh ingredients. You know the type of books I mean. First DC comic I bought, and probably the first DeMatteis I've read. Thank you so much! I still use lines from that run. And the fact that Blue Beetle was a Dylan fan was on my mind when I bought my first Dylan album. You're very welcome, Mario. I don't recall the Beetle-Dylan connection. Now I'm going to have to root around through the issues and find the references! Thanks for checking in. Very much appreciated!